Termite is the most destroying insect in the world. All the wooden surface are not secure from Termites. A termite team can finish a jungle within a month. Termites are not so injurious or Diseases spreader. But Termite has been destroying your valuable wooden furniture, Doors and Windows, Door Frames, Books, Valuable Documents, Clothe wares and other most valuable properties. Termite likes damp and dusty surface. Termite has a queen which controlling them. A termite queen size would be 8″ to 16″ long. Some time we called them white ant. Basically termite treatment some critical job. Pre-Construction Termite Control is most effective for the properties. ZERO PEST has been providing 20 (twenty) Years guarantee for Pre Construction Termite Treatment. Before crusting of Plinth level is the right time of Pre Construction Termite Control. If there is mat foundation of building then it has to apply before Casting of mat binding all floor areas. Treat and Trench Soil around external concrete slab edge. Trench and treat Soil around walls and peelers in the sub floor area. And Digg patio areas and treat soil area there is a high risk treatment nest location. Digging Bait Station Points surrounding the property premises. Regular checking and putting baits until fully destroy the termite colony. 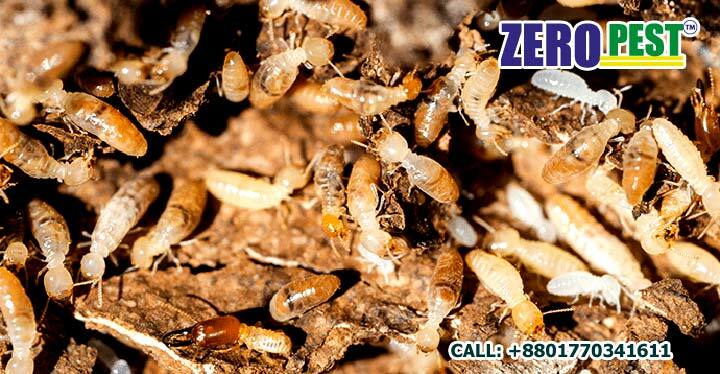 Zero Pest has been providing 05 Years Guarantee for household Termite Treatment. Our expert termite control inspection team will find infested areas. The company will treatment against termite with most effective and safe methods.